July 17 (Bloomberg) -- Crude oil rose more than $1 a barrel as construction of single-family dwellings jumped by the most since 2004, a sign the worst of the recession may have passed. Oil increased after the Commerce Department reported that construction of single-family homes climbed 14 percent in June. The report also showed that total housing starts rose to the highest since November. Futures tumbled to $32.40 a barrel in December, a four-year low, as the economic contraction curbed demand, allowing stockpiles to grow. Crude oil for August delivery rose $1.54, or 2.5 percent, to $63.56 a barrel at 2:50 p.m. on the New York Mercantile Exchange, the highest settlement price since July 6. Oil climbed 6.1 percent this week, the first weekly gain since June 12. Futures are down 57 percent from a record $147.27 a barrel reached on July 11, 2008. Gasoline for August delivery rose 5.64 cents, or 3.3 percent, to end the session at $1.7699 a gallon on the New York exchange. It was the highest settlement since July 2. “Some green shoots may finally be starting to appear, which is good for the market,” said Chip Hodge, who oversees a $9 billion natural-resource-company bond portfolio as managing director at MFC Global Investment Management in Boston. U.S. industrial production fell in June at the slowest pace in eight months, according to a report on July 15, when oil prices increased 3.4 percent. China, the second-biggest energy consumer after the U.S., processed a record volume of crude oil in June as faster economic growth boosted fuel demand and refining profits encouraged production. Oil processing rose for a fifth month to 31.9 million metric tons, or about 7.76 million barrels a day, China Mainland Marketing Research Co., which compiles data for the government, said in a statement today. The International Energy Agency forecast that global demand will increase by 1.4 million barrels a day, or 1.7 percent, to 85.2 million next year, in a July 10 report. Growth will be concentrated in emerging economies outside the Organization for Economic Cooperation and Development, according to the Paris-based agency. Non-OECD consumption will rise 3.5 percent in 2010 as demand among members of the group increases 0.2 percent, the report showed. Rising crude oil and gasoline prices helped send the Reuters/Jefferies CRB Index of 19 raw materials higher. The index gained 1.7 percent to 245.05, the biggest increase since June 11. Brent crude for September settlement climbed $1.63, or 2.6 percent, to end the session at $65.38 a barrel on London’s ICE Futures Europe Exchange. The Organization of Petroleum Exporting Countries will trim shipments by 0.8 percent to 22.55 million barrels a day in the four weeks ended Aug. 1, consultant Oil Movements said yesterday. OPEC estimated in a July 14 report that its compliance with record supply cuts announced last year dropped to 72 percent in June after production rose for a third month. Oil may rise next week as better-than-expected second- quarter earnings bolster the outlook for a recovery in demand, a Bloomberg News survey of analysts showed. Seventeen of 37 analysts surveyed, or 46 percent, said futures will climb through July 24. Ten respondents, or 27 percent, forecast that prices will be little changed, and 10 expected a decline. Crude oil volume in electronic trading on the Nymex was 464,054 contracts as of 3:02 p.m. in New York. Volume totaled 575,045 contracts yesterday, 15 percent higher than the average over the past three months. Open interest was 1.17 million contracts yesterday. The exchange has a one-business-day delay in reporting open interest and full volume data. July 17 (Bloomberg) -- Gold advanced on rising demand for the precious metal as a hedge against inflation after U.S. housing starts increased in June, adding to signs the world’s biggest economy is stabilizing. Silver also gained. Home-building starts rose 3.6 percent to an annual rate of 582,000, the highest since November, the Commerce Department said today in Washington. Building permits, a sign of future construction, jumped the most in a year. Crude-oil futures, used by some investors as an inflation indicator, advanced. Some investors use gold as a store of value. “Fresh buying will be supported by a weakening dollar and a build in inflation expectations,” Suki Cooper, a Barclays Capital analyst in London, said today in a report. Gold futures for August delivery gained $2.10, or 0.2 percent, to $937.50 an ounce on the New York Mercantile Exchange’s Comex division. Bullion for immediate delivery in London advanced $1.24, or 0.1 percent, to $938.59 an ounce at 7:21 p.m. local time. Silver futures for September delivery increased 16.8 cents, or 1.3 percent to $13.403 an ounce in New York. Gold “will continue to look to both the dollar and broader market movement for direction,” James Moore, an analyst at TheBullionDesk.com in London, said today in a note. The metal rose to $937.50 in the London afternoon “fixing,” the price used by some mining companies to sell their output, from $934.50 in the morning fixing. The U.S. Dollar Index, a six-currency gauge of the greenback’s value, was headed for a loss of about 1 percent for the week. Gold, which tends to rise when the dollar falls, rose 2.7 percent this week after two straight weekly drops. Crude-oil futures climbed as much as 3.2 percent in New York, nearing $64 a barrel. Oil headed for a weekly increase of more than 6 percent. “We expect markets to become thinner and more volatile” in the next several weeks, Moore said. He predicted gold will trade between $905 and $950 an ounce. Investment in the SPDR Gold Trust, the biggest exchange- traded fund backed by bullion, rose 0.3 metric ton to 1,094.85 tons as of yesterday, the company’s Web site showed. That’s the first increase since the fund reached a record 1,134.03 tons almost seven weeks ago. July 18 (Bloomberg) -- The dollar and the yen posted the biggest declines against the euro since May as corporate earnings topped forecasts and U.S. reports showing gains in housing and a slower decline in industrial production. The Canadian dollar advanced to a one-month high against the greenback as crude oil rebounded. The Mexican peso had the biggest gain in two months this week after policy makers said yesterday that they will “pause” after cutting the overnight interest rate a quarter percentage point to 4.5 percent. The U.S. currency fell 1.2 percent to $1.4102 per euro yesterday, from $1.3936 on July 10. The yen lost 3 percent to 132.85 per euro, from 129 a week earlier. The declines were the biggest since the five-day period ended May 22. The Japanese currency fell 1.8 percent to 94.19 per dollar. The Mexican peso rebounded from a 2 1/2 month low, rising 2.6 percent this week to 13.34 per dollar. The central bank signaled it may hold off on further rate cuts after lowering after lowering the rate a seventh straight month yesterday. The yen lost 6.4 percent against the Canadian dollar and the greenback fell 3.6 percent versus the Brazilian real after stocks advanced worldwide, reducing demand for the U.S. and Japanese currencies as a haven from the global recession. The Standard & Poor’s 500 Index rose 6.97 percent in its biggest rally since March as companies from Goldman Sachs Group Inc. to Intel Corp. and Johnson & Johnson reported results that topped analysts’ estimates. Reports this week showed the decline in the U.S. industrial production slowed in June, and the U.S. housing starts rose to the highest level since November. “The currencies of emerging markets and resource-rich nations fare well against the dollar and the yen when stocks are on the rising trend, reflecting optimism about the economy,” said Yuji Kameoka, a strategist in Tokyo at Daiwa Institute of Research Ltd., a unit of Japan’s second-largest brokerage group. Investors should sell the greenback against the Canadian dollar, the Hungarian forint and the British pound as higher- than-expected corporate earnings encourage the purchase of riskier assets, John Normand, head of global currency strategy in London at JPMorgan Chase & Co. wrote in a research note yesterday. The dollar has been trading with 3 cents above and below $1.40 per euro since June 3, when it reached a six-month low of $1.4338, as investors debated whether the global recovery is sustainable. Most Federal Reserve officials judged the economy at risk to further shocks last month, the central bank said in minutes of the June 23-24 meeting released this week. Fed Chairman Ben S. Bernanke will deliver his semi-annual monetary policy report before Congress on July 21. “We’ll continue to have the push-and-pull between inflation and deflation, between flight-to-quality and global risk seeking,” said Mark Rzepczynski, managing director at Lakewood Partners, a fund management firm in Boston. The yen appreciated against 13 of 16 most actively traded currencies in the past month, rising 1 percent versus the Mexican peso. The yen is weaker against the entire group this year. Japan’s new top currency official said yesterday the government would consider stepping into the foreign-exchange market if abrupt yen moves hurt the economy. “We’ll make judgments based on whether excessive movements in the currency market will adversely affect the economy,” Rintaro Tamaki, vice finance minister for international affairs, said in a Tokyo yesterday. The Canadian dollar appreciated the most of the 16 major currencies against the yen this week, rising 6.4 percent to 84.60 yen, as crude oil gained 6 percent to $63.51 a barrel. Investors should buy the Canadian dollar against the yen because risk appetite is improving and Japan’s currency may suffer from political uncertainty, according to Citigroup Inc.
Citigroup entered a so-called long Canadian dollar position against the yen and expects it will reach 90 yen, a team of strategists wrote in a research note on July 16. In a long position, a trader or investor buys a currency on bet it will appreciate. The Bank of Canada is likely to keep its key interest-rate at 0.25 percent on a policy meeting on July 21, according to the median forecast of 20 economists surveyed by Bloomberg News. FKLI futures July contract rose 9.5 points lower to close at 1123.5 as compare to previous trading session with total 8,198 lots traded in the market. FKLI were traded higher during trading session as overnight Dow Jones and regional indices were traded higher during trading session. 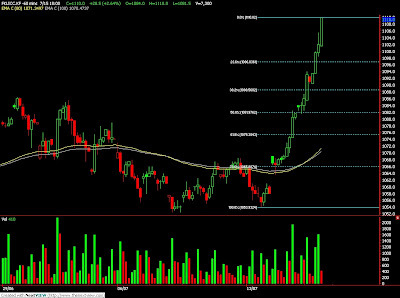 Technically, FKLI continue to search new heights during the trading session after found supports at 1108.5 regions. Based on our technical knowledge, FKLI seems temporary resisted around resistance levels at 1142 and 1150 regions. 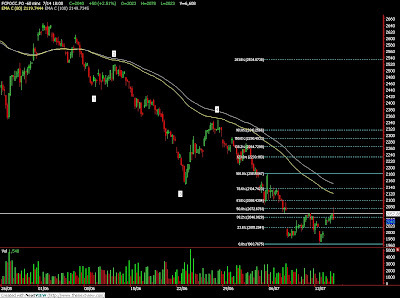 Our opinion suggests that FKLI is currently riding on a bull rally where support still seen at 1090 and 1068.5 regions. Traders were advice to hold if position if short term resistance levels at 1128.5 and 1131 were not be able to be penetrated in the coming trading session. FCPO 3rd month Oct Futures contract surge RM103 higher to close at RM2123 levels as compare to previous trading session with 7,437 lots traded in the market. CPO price were traded higher despite crude oil and soybean oil were traded lower during electronic trading. Technically, CPO breached resistance level at RM2070 region and continue to surge high towards next resistance levels at RM2124; previous high. Based on our technical analyst, our opinion suggest that CPO would traded lower in the coming trading session provided resistance levels at RM2128 and RM2170 were not violated. Traders were advice to hold short position while place tight stop order around the resistance levels while be alert around support levels at RM2050 and RM2000 regions. July 17 (Bloomberg) -- Crude oil rose in New York, heading for its first weekly gain in more than a month, as equities climbed after economist Nouriel Roubini said the recession that’s curbed fuel consumption will end this year. Oil rose after Roubini, the New York University professor who predicted the financial crisis, spoke at a conference in New York yesterday. U.S. stocks climbed for a fourth day on the forecast, the longest winning streak in six weeks, as companies from Goldman Sachs Group Inc. to Johnson & Johnson beat analysts’ estimates. “We have a stream of fairly positive earnings as well as some pretty optimistic guidance from various companies on the outlook for the rest of the year, and that’s feeding through to oil,” said Toby Hassall, a research analyst at Commodity Warrants Australia Pty in Sydney. Crude oil for August delivery rose as much as 33 cents, or 0.5 percent, to $62.35 a barrel on the New York Mercantile Exchange. It was at $62.05 a barrel at 9:53 a.m. Sydney time. Futures are up 4 percent this week and are set for the first weekly gain since June 12. The Standard & Poor’s 500 Index gained 0.9 percent in New York, while the Dow Jones Industrial Average rose 1.1 percent to 8,711.82. U.S. crude inventories fell 2.81 million barrels to 344.5 million last week, the Energy Department said July 15. Stockpiles were forecast to decline 2.1 million barrels, according to analysts surveyed by Bloomberg News. Gasoline inventories climbed 1.44 million barrels to 214.6 million, the Energy Department report showed. Supplies were forecast to increase 875,000 barrels. Gasoline for August delivery rose 0.65 cent, or 0.4 percent, to $1.72 a gallon on the New York Mercantile Exchange at 9:36 a.m. Sydney time. Yesterday, it increased 0.54 cent, or 0.3 percent, to end the session at $1.7135. Brent crude for August settlement declined 34 cents, or 0.5 percent, to end the session at $62.75 a barrel on London’s ICE Futures Europe Exchange yesterday. The August contract expired yesterday. The more-actively traded September contract gained 23 cents, or 0.4 percent, to settle at $63.75. FKLI futures July contract rose 4 points higher to close at 1114 as compare to previous trading session with total 8,180 lots traded in the market. FKLI traded lower after manage to reach new high at 1121.5 as Dow Jones and regional indices traded firm against the selling pressure. 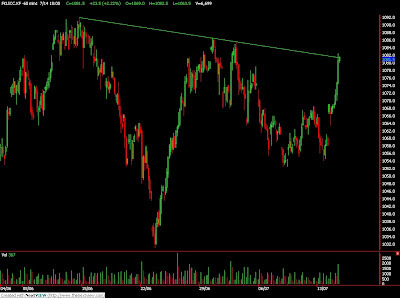 Technically, FKLI seems fail to break resistance levels at 1120 regions during trading session. Based on our technical analyst, our opinion suggests that FKLI manage to reach 423.6% Fibonacci projection levels at 1120 regions. We expect FKLI would have certain degree of profit taking activities in the next trading session where support seen at 1087 and 1068.5. 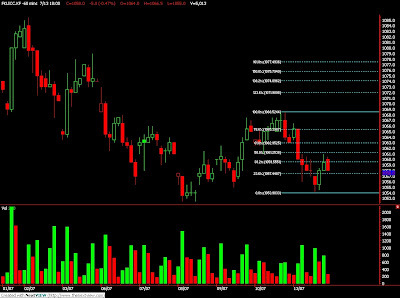 Traders were advice to position yourselves on long position provided support levels at 1068.5 must not be violated. Resistances levels were still remain seen at 1121.5 and 1144 regions. FCPO 3rd month Oct Futures contract fall RM65 lower to close at RM2020 levels as compare to previous trading session with 9,215 lots traded in the market. New active Oct CPO futures contract plunge as crude oil and soybean oil plunge during electronic trading despite were traded firm on overnight closing. 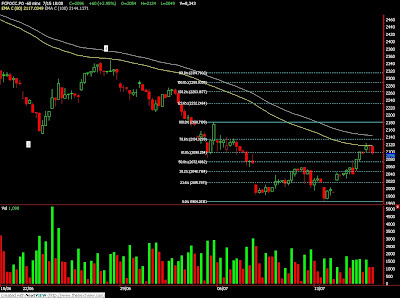 Technically, CPO plunge after several attempts to breach resistance levels at RM2100 regions. Based on our technical analyst, our opinion suggests CPO would price would trade lower in the coming trading session provided next critical supports at RM1998 and RM1964 were violated during trading session. 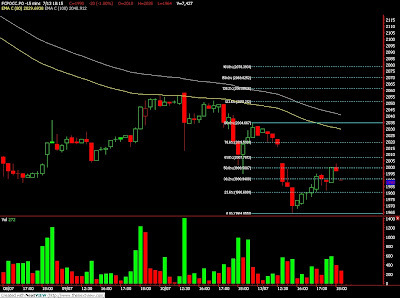 Traders were advice to hold short position once support levels were breach. 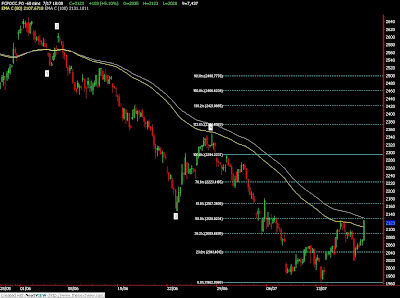 Resistances levels were seen at RM2068 and RM2100 regions. July 16 (Bloomberg) -- Palm oil futures in Malaysia fell as investors cashed in on yesterday’s gains and crude oil and soybean oil declined. Palm oil futures jumped 3.3 percent yesterday, extending a 2.3 percent gain a day earlier, as exports from Malaysia, the world’s second-largest producer, rose 18 percent in the first half of the month, boosting optimism demand from overseas buyers is picking up. “We’re seeing profit-taking,” Donny Khor, floor manager at OSK Futures & Options Sdn. Bhd. in Kuala Lumpur, said today by phone. Palm oil prices were also “affected by external market factors,” he said. Soybean oil and palm oil can be processed to make cooking oil or biodiesel. Palm oil for September delivery lost as much as 1.4 percent to 2,073 ringgit ($581) a metric ton on the Malaysia Derivatives Exchange, and traded at 2,087 ringgit a ton at 11:38 a.m. local time. Soybean oil for December delivery lost as much as 1 percent to 34.42 cents a pound in after-hours electronic trading on the Chicago Board of Trade, after closing 1 percent higher yesterday. It traded at 34.52 cents a pound, down 0.8 percent at 11:31 a.m. Singapore time. Soybean oil fell on concern supply of the oilseed may rise as yields in the U.S., the world’s biggest grower and exporter, are forecast to gain. Soybean yields will rise to 43 bushels an acre this year, from 39.6 bushels an acre last year, AIR Worldwide Corp., a catastrophe-risk modeling firm in Boston said yesterday. That compares with the 42.6 bushels forecast by USDA in its July 10 report. Crude oil for August delivery was little changed at $61.56 a barrel in New York at 11:49 a.m. Singapore time, after losing as much as 0.4 percent earlier. Still faster economic growth in China, the world’s biggest consumer of edible oils, may cap declines in palm oil prices, Khor said. The gross domestic product of China expanded 7.9 percent in the second quarter from a year earlier, after a 6.1 percent gain in the previous three months, the statistics bureau said in Beijing today. That’s more than the 7.8 percent median estimate of 20 economists surveyed by Bloomberg News. “That will certainly induce consumption,” Khor said. July 16 (Bloomberg) -- Crude oil rose for a second day as equities climbed and a government report showed a bigger-than-forecast drop in oil supplies in the U.S., the world’s largest energy consumer. U.S. stocks rallied 3 percent after Intel Corp. forecast sales that beat analysts’ estimates and gauges of manufacturing improved. Crude inventories fell 2.81 million barrels to 344.5 million last week, the Energy Department said in a report yesterday. Crude oil for August delivery rose as much as 47 cents, or 0.8 percent to $62.01 a barrel on the New York Mercantile Exchange. The contract was at $61.80 at 9:54 a.m. Sydney time. Yesterday, it gained $2.02, or 3.4 percent, to settle at $61.54. Crude stockpiles were forecast to decline 2.1 million barrels, according to analysts surveyed by Bloomberg News. Refineries operated at 87.9 percent of capacity, the highest since August. “Crude oil is not in any shape to make another run at $70 and looks to remain near $60 with a possible downside risk,” Sander said. The Dow Jones Industrial Average climbed 256.72 points, or 3.1 percent, its best gain in three months. The Standard & Poor’s 500 Index added 3 percent in New York, extending its biggest three-day advance since March. Gasoline inventories climbed 1.44 million barrels to 214.6 million, the highest since April, the Energy Department report showed. Supplies were forecast to increase 875,000 barrels. Gasoline for August delivery gained 0.98 cents to $1.7179 a gallon on the New York Mercantile Exchange at 9:32 a.m. Sydney time. Yesterday, the contract rose 6.15 cents, or 3.7 percent, to end the session at $1.7081. Supplies of distillate fuel increased 553,000 barrels to 159.3 million in the week ended June 10, the highest since January 1985, the report showed. A 2 million-barrel gain was forecast, according to the median of 14 estimates by analysts in the Bloomberg News survey. Brent crude for August settlement rose $2.23, or 3.7 percent, to end the session at $63.09 a barrel on London’s ICE Futures Europe Exchange yesterday. July 15 (Bloomberg) -- Soybeans fell the most in a week on concern demand for livestock feed will drop after Tyson Foods Inc., the world’s largest meat producer, said it will sell five farms and reduce its hog-breeding herd by 29 percent. About 20,000 sows will be slaughtered in the next 10 weeks, leaving 50,000, Gary Mickelson, a spokesman for Springdale, Arkansas-based Tyson, said today in an e-mail. The company also is selling five farms in Arkansas and Missouri because of weak pork demand, he said. A bushel of soybeans weighing 60 pounds (27 kilograms) produces about 48 pounds of animal feed, according to Chicago Board of Trade estimates. Soybean futures for November delivery fell 13.5 cents, or 1.5 percent, to $9.045 a bushel on the CBOT. Earlier, the price rose as much as 2.2 percent to $9.38, the highest since July 7. Soybeans are down 7.7 percent this year as beneficial weather in the past month boosted yield prospects after rain delayed U.S. planting. The U.S. soybean crop was valued last year at $27.4 billion, the second-largest behind corn, government figures show. July 15 (Bloomberg) -- Gold jumped the most in more than two months as the dollar slumped and oil rallied, boosting demand for alternative assets to hedge against inflation. Silver also rose. A 17 percent jump in gasoline drove the U.S. consumer price index up 0.7 percent in June, the fastest pace in a year, Labor Department figures showed today. Crude-oil futures, used by some investors as an inflation-outlook guide, soared. The U.S. Dollar Index, a six-currency gauge of the greenback’s value, dropped as much as 1.1 percent. Gold tends to rise when the dollar weakens. “Gold is steadily ticking higher, and recent dollar weakness and the gain in oil prices are favoring the move,” Pradeep Unni, a Richcomm Global Services analyst in Dubai, said today in a report. “Gold has enough potential to rise higher,” Unni said. Gold futures for August delivery climbed $16.60, or 1.8 percent, to $939.40 an ounce on the New York Mercantile Exchange’s Comex division. That marks the biggest gain for a most-active contract since April 20. Bullion for immediate delivery in London advanced $14.10, or 1.5 percent, to $939.80 an ounce at 8:39 p.m. local time. While consumer prices climbed in June, the decline in U.S. industrial output slowed to lowest rate in eight months, the Federal Reserve reported today. The Empire State Manufacturing index slipped this month at the slowest pace since it last rose, in April 2008, the Federal Reserve Bank of New York said today. Crude oil gained as much as 4.1 percent to $61.98 a barrel in New York. U.S. inventories fell 2.81 million barrels last week, the Energy Department said today. That was more than the estimated 2.1 million drop in a Bloomberg News survey of analysts. The country is the world’s largest energy consumer. Gold advanced to $938 an ounce in the London afternoon “fixing,” the price used by some mining companies to sell their output, from $930 in the morning fixing. Investment in the SPDR Gold Trust, the biggest exchange- traded fund backed by bullion, fell 1.4 percent to 1,094.54 metric tons as of yesterday from the previous day, the company’s Web site shows. The fund’s holdings have declined 3.5 percent from a record of 1,134.03 tons reached on June 1. Silver futures for September delivery rose 35.3 cents, or 2.7 percent, to $13.208 an ounce in New York. Earlier, the metal touched $13.38, the highest for a most-active contract since July 6. July 16 (Bloomberg) -- The dollar traded near a two-week low against the euro as Asian stocks extended a global equity rally, encouraging investors to buy higher-yielding assets. The yen was near the lowest in a week versus the 16-nation currency before a U.S. report that economists said will show job losses in the world’s largest economy slowed last week, adding to signs the worst of the recession may be over. The Australian dollar rose the most in a month yesterday before a Chinese government report today that may show economic growth increased, boosting demand for the currencies of resource-rich nations. “The recent slew of economic data and incoming indicators seem to suggest that the situation is not as bad as the market had feared,” said Kengo Suzuki, manager of the foreign bond department in Tokyo at Mizuho Securities Co., a unit of Japan’s second-largest banking group. “This will put downward pressure” on the yen and the dollar. The dollar traded at $1.4099 per euro at 9:16 a.m. in Tokyo from $1.4107 yesterday in New York, when it fell to $1.4135, the weakest level since July 2. The yen was at 133.04 per euro from 132.95 yesterday when it declined 1.8 percent, the most since May 28. The yen bought 94.36 versus the dollar from 94.23. Australia’s currency traded at 80.24 U.S. cents from 80.32 cents in New York yesterday, when it gained 1.3 percent, the biggest advance since June 11. The Nikkei 225 Stock Average advanced 2.2 percent and the MSCI Asia Pacific Index of regional shares climbed 1.3 percent. U.S. initial jobless claims fell to 553,000 in the week ended July 11 from 565,000 the previous week, according to the median forecast of economists surveyed by Bloomberg News. The Labor Department report is due at 8:30 a.m. in Washington. China’s economy may have expanded 7.8 percent in the second quarter, compared with a 6.1 percent growth in the previous three months, as record lending and surging investment drove a rebound from the weakest growth in almost a decade, according to a Bloomberg News survey of economists. Asia’s second-largest economy grew 7.9 percent in the second quarter, the Beijing Times newspaper reported today, citing an unidentified person who in turn cited an official with the national statistics bureau. The economy grew 7.1 percent in the first half, the newspaper said. Losses in the dollar and the yen may be tempered after CIT Group Inc., the commercial lender running short of cash, said yesterday it probably won’t receive a federal bailout and is studying alternatives with advisers. “There is no appreciable likelihood of additional government support being provided over the near term,” the New York-based company said in a statement. CIT, once the biggest independent commercial lender, faces bankruptcy if no federal aid emerges, Standard & Poor’s said earlier this week. FKLI futures July contract surge 28.5 points higher to close at 1110 as compare to previous trading session with total 7,300 lots traded in the market. FKLI surge fierce despite regional indices were closed mix on closing. Technically, FKLI surge up after manage to break previous resistance levels at 1094 regions. Based on our technical analyst, our opinion suggest FKLI was not affirmed riding on a bull rally on longer term basis if fail to break next resistance levels at 1120 and 1144 regions. Traders were advice to put on hold for positioning trades until affirmative situation sighted. Supports were seen at 1097 and 1088 regions. FCPO 3rd month Sept Futures contract surge RM67 higher to close at RM2103 levels as compare to previous trading session with 8,508 lots traded in the market. CPO surge high during early trading but seen consolidate between RM2120 – RM2100 on the second trading session as crude oil and soybean oil electronic trading were traded flat. Technically, CPO price seems resisted around 80 – day and 100 – day exponential moving average at RM2117 levels. Based on our technical knowledge, our opinion suggest CPO price would traded lower in the coming trading session provided resistance level at RM2134 and RM2181 were strictly not violated. Traders were advice to hold short position once support levels at RM2095 and RM2040 were affirmed breached during trading sessions. July 15 (Bloomberg) -- Palm oil futures in Malaysia rallied for a second day to the highest since July 7 after exports gained this month and India, the second-largest user, said it won’t impose higher taxes on the commodity. “Everything hinges now on demand,” Carey Wong, an analyst at OCBC Investment Research Pte., said by phone from Singapore. The market is “definitely” seeing a recovery in demand from overseas buyers, she added. Palm oil for September delivery gained 4.2 percent to 2,122 ringgit ($595) a metric ton on the Malaysia Derivatives Exchange at 3:45 p.m. local time. The contract has jumped 6.6 percent in the last two days. Shipments from Malaysia, the second-largest producer, increased to 659,143 metric tons in the first 15 days of July, 18 percent higher than the same period in June, according to surveyor Intertek. Societe Generale de Surveillance, another surveyor, estimated a 15 percent gain to 653,474 tons. India has no plans to increase duties on imports of palm oil, Commerce Minister Anand Sharma said today in a written reply to a member’s query in the upper house of Parliament. Maintaining duty-free crude palm oil imports and the 7.5 percent tax on refined, bleached and deodorized palmolein would ensure supplies remain at “affordable” rates, he said. Palm oil is “riding on this economic recovery story as well as higher crude oil prices,” OCBC’s Wong said. Higher crude prices can lead gains in the tropical commodity as palm oil can be used to produce biofuels. Crude oil for August delivery in New York added as much as 1.9 percent to $60.67 a barrel in Asian trading and was at $60.51 a barrel at 3:42 p.m. Singapore time. Economic growth in China, the world’s third-largest economy and biggest user of edible oils, rebounded to 7.8 percent in the second quarter, according to a Bloomberg News survey of economists. July 14 (Bloomberg) -- The Organization of Petroleum Exporting Countries expects a slower rebound in oil demand next year than the International Energy Agency, based on a weaker outlook for the global economy. Worldwide crude-oil consumption will increase by 500,000 barrels a day, or 0.6 percent, to 84.3 million a day in 2010 as industrial production gradually picks up after this year’s recession, OPEC said in a report today. That compares with an increase of 1.4 million barrels a day, or 1.7 percent, to 85.2 million, forecast by the IEA on July 10. Next year’s 2.3 percent increase in global gross domestic product will be driven by emerging countries, such as China and India, while economic growth among developed nations will remain “anemic,” OPEC said. The Paris-based IEA, which advises 28 consuming countries, assumes a stronger global GDP rebound of 2.5 percent. OPEC’s 2010 projection is 300,000 barrels a day lower than the 84.6 million barrels a day estimated in the organization’s World Oil Outlook released on July 8. The monthly report is based on more timely data than the outlook, which projects through to 2013. OPEC, whose members account for about 40 percent of global oil supply, anticipates that demand for its own oil will shrink for a third year in 2010, by 400,000 barrels a day to 28.1 million a day. The organization kept its demand estimate for 2009 nearly unchanged at 83.8 million barrels a day, 40,000 barrels a day higher than in the previous monthly report, citing an absence of recovery signals in developed economies outside the U.S.
Oil’s 38 percent rally since late April has encouraged some OPEC members to backtrack on record output cuts announced last year. Crude futures last traded for $60.45 a barrel as of 11:24 a.m. London time on the New York Mercantile Exchange. OPEC’s compliance rate slipped for a third month, to 72 percent, from 75 percent in May, the report showed. At its last meeting on May 28, the organization resolved to fully implement 4.2 million barrels a day of output curbs. The 11 members bound by production quotas, which exclude Iraq, pumped 26.027 million barrels a day in June, an increase of 57,000 barrels a day from May, the group said, citing secondary sources that include estimates from analysts and news organizations. Angola, Saudi Arabia and Iran increased output the most in June, the report said. OPEC estimated that production from outside the group will increase by 330,000 barrels a day next year to 50.96 million barrels a day, as a result of projects in Azerbaijan, Kazakhstan and Canada. Non-OPEC supply expectations for 2009 were kept nearly unchanged at 50.62 million barrels a day. July 15 (Bloomberg) -- Crude oil rose after an industry report showed a decline in gasoline inventories in the U.S., the world’s largest energy consumer. Oil climbed from an eight-week low as gasoline supplies fell 69,000 barrels, the industry-funded American Petroleum Institute said yesterday. A report today from the Energy Department’s Energy Information Administration may show that stockpiles gained for a fifth week, according to analysts surveyed by Bloomberg News. Crude oil for August delivery gained as much as 36 cents, or 0.6 percent to $59.88 a barrel on the New York Mercantile Exchange. It was at $59.83 at 8:47 a.m. Sydney time. Yesterday, it declined to $59.52, the lowest settlement since May 18. The Energy Department report will probably show gasoline inventories climbed 875,000 barrels in the week ended July 10, according to the median of 14 responses in the Bloomberg News survey. The department is scheduled to release its weekly petroleum supply report at 10:30 a.m. in Washington. The API collects stockpile information on a voluntary basis from operators of refineries, bulk terminals and pipelines. The government requires that reports be filed with the energy Department for its weekly survey. July 15 (Bloomberg) -- The yen traded near a one-week low against the euro as Asian stocks rose on speculation a U.S. report today will show industrial production shrank at a slower pace, adding to signs the worst of the global recession is over. Japan’s currency fell against 15 out of 16 most-active currencies after earnings at Goldman Sachs Group Inc. and Intel Corp. beat analysts’ forecasts, damping demand for safer assets. The Australian and New Zealand dollars gained for a third day against the yen as rising Asian stocks support demand for the higher-yielding assets of the two South Pacific nations. The yen traded at 130.76 per euro as of 9:35 a.m. in Tokyo from 130.62 yesterday in New York. It earlier dropped to 130.96, the weakest since July 8. The dollar bought $1.3982 per euro from $1.3967. The yen was at 93.59 versus the dollar from 93.50. Australia’s currency rose to 74.29 yen from 74.14 yesterday. New Zealand’s dollar was at 59.96 yen from 59.73. Interest rates of 3 percent in Australia and 2.5 percent in New Zealand, compared with 0.1 percent in Japan and as low as zero in the U.S., typically attract investors to the South Pacific nations’ assets. The Bank of Japan will keep its target interest rate at 0.1 percent at a policy meeting today, according to a Bloomberg News survey. Factory production probably fell 0.6 percent last month after a 1.1 percent drop in May, according to a Bloomberg News survey before the Federal Reserve releases the data. Shares gained after Goldman Sachs said second-quarter profit rose amid record trading and stock underwriting. Net income in the three months ended June 26 was $3.44 billion, or $4.93 a share, the bank said. That surpassed the $3.65 per-share average estimate of analysts surveyed by Bloomberg. The Nikkei 225 Stock Average rose 0.5 percent and the MSCI Asia Pacific Index of regional shares advanced 0.4 percent. JPMorgan Chase & Co. and International Business Machines Corp. are among other companies in the Standard & Poor’s 500 Index due to report results this week. FCPO 3rd month Sept Futures contract surge RM46 higher to close at RM2036 levels as compare to previous trading session with 6,771 lots traded in the market. CPO price were traded higher as soybean oil and crude oil were traded firm in overnight and electronic trading. Technically, CPO price seem manage to rebound 50% Fibonacci rebound levels at RM2073 regions after seem temporary bottom at RM1960 regions. Based on our technical analyst, our opinion suggest CPO price show some bullish indication that CPO is about reach its floor zone. However, it’s still unclear of any trend reversal signal. For short term trading, traders were still advice to hold short position cautiously around resistance level at RM2085 and RM2100 regions while support seen at RM2003 and RM1980 regions. FKLI futures July contract surge 23.5 points higher to close at 1081.5 as compare to previous trading session with total 6,699 lots traded in the market. FKLI surge high as Dow Jones and regional indices were traded strong during trading session. Technically, FKLI manage to breach multiple previous resistance levels at 1068 and 1079 regions while close on trend line form from previous high. Based our technical analyst, our opinion suggest FKLI might reverse towards uptrend after long consolidation for more than 2 weeks. Traders were advice to hold long on pull back in the coming trading session provided support levels at 1068 and 1052 were not violated. Resistances levels were seen at 1086 and 1094 regions. July 14 (Bloomberg) -- Palm oil futures gained in Malaysia as crude oil futures gained, increasing the appeal of biofuels produced from the tropical oil. August-delivery crude oil gained as much as 0.9 percent to $60.20 a barrel amid signs fuel demand will climb as economic growth in China accelerates. Palm oil tends to follow changes in crude oil prices, as vegetable oils can be used for biofuels. “When people see that they can make money on it, they will jump on it,” Ben Santoso, an analyst at DBS Vickers Securities (Singapore), said, referring to biodiesel production. Palm oil for September delivery rose as much as 2.7 percent to 2,044 ringgit ($570) a metric ton on the Malaysia Derivatives Exchange. Futures traded at 2,034 a ton at 11:48 a.m. local time. Suppliers of biodiesel to Germany make a gross profit of about $93 a metric ton, when processing palm oil purchased at 2,035 ringgit a ton, assuming crude oil trades at $60 a barrel, Santoso said. July 14 (Bloomberg) -- Crude oil rose for the first time in two days as U.S. stocks rallied after analyst Meredith Whitney recommended buying shares of Goldman Sachs Group Inc.
Oil rose from an eight-week low after Whitney gave Goldman Sachs the only “buy” rating among the eight companies she covers, and said banks may advance 15 percent. The Standard & Poor’s 500 Index rose 2.5 percent, its best advance since June 1. Crude oil for August delivery gained as much as 50 cents, or 0.8 percent, to $60.19 a barrel on the New York Mercantile Exchange. The contract was at $59.96 at 8:29 a.m. Sydney time. Yesterday, it fell 20 cents to $59.69 a barrel, the lowest settlement since May 19. An Energy Department report on July 15 is forecast to show that U.S. gasoline inventories increased 750,000 barrels last week, according to a Bloomberg News survey of analysts. It would be the fifth-straight gain. July 13 (Bloomberg) -- Soybeans dropped for the first time in three sessions on speculation that cool, wet weather in the U.S. Midwest will help plant development and increase yield potential of the crop. About 66 percent of U.S. soybeans were in good or excellent condition by yesterday, compared with 59 percent a year earlier, the Department of Agriculture said today. Average rainfall and below-normal temperatures in the next 10 days will help crop development and ease heat stress on plants in the Mississippi River Valley, DTN Meteorlogix LLC said today in a report. “Weather does not seem to offer any lasting or widespread threat” to the crops, Roy Huckabay, a Linn Group executive vice president in Chicago, said today in an e-mail. “We are getting dry in Minnesota, Wisconsin and Ohio, but I do not think the market will bite off on that” because rain is forecast for those states, he said. Soybean futures for November delivery dropped 5.5 cents, or 0.6 percent, to $9.115 a bushel in Chicago, after rising 2.8 percent in the previous two sessions. The most-active contract fell 8.8 percent last week, the fourth drop in five weeks. The soybean crop is the nation’s second-largest, valued at $27.4 billion last year, government figures show. Corn is the biggest, at $47.4 billion. The U.S. is the world’s leading producer and exporter of both crops. July 14 (Bloomberg) -- The yen weakened for a second day against the euro on speculation Goldman Sachs Group Inc. will report stronger earnings today, spurring investors to increase holdings of higher-yielding assets. The euro traded near a one-week high against the dollar before a German report that economists said will show investor confidence rose to a three-year high in July, adding to evidence the recession in Europe’s largest economy is bottoming out. New Zealand’s dollar rose against 15 of the 16 most-active currencies after Reserve Bank Governor Alan Bollard said the nation’s economy is likely to start recovering earlier than many of its trading partners. The yen fell to 130.25 per euro as of 8:29 a.m. in Tokyo from 129.95 yesterday in New York. The euro traded to $1.3997 from $1.3978. The yen was at 93.05 per dollar from 92.97. German investor confidence rose to 47.8 this month from 44.8 in June, according to a Bloomberg News survey of economists before the ZEW Center for European Economic Research releases its index of investor and analyst expectations today. The reading would be the highest since May 2006. U.S. stocks advanced yesterday after analyst Meredith Whitney gave Goldman Sachs the only “buy” recommendation among the eight companies she covers. She told CNBC that the New York- based financial institution is going to “surprise big” when it reports second-quarter results today. The Standard & Poor’s 500 Index rose 2.4 percent after four weeks of losses, and Germany’s DAX Index climbed 3.2 percent. The New Zealand dollar advanced for a second day after the central bank governor said early signs of a global recovery have now emerged. “New Zealand looks likely to start recovering ahead of the pack,” Bollard said in notes for a speech delivered today in Napier. “We hope that in the next phase of recovery in financial market sentiment and return to risk seeking, the markets will be more discriminating about New Zealand,” he said. FKLI futures July contract fall 5 points lower to close at 1058 as compare to previous trading session with total 5,013 lots traded in the market. FKLI plunge as most of the regional plunge during trading session but manage to recover before trading session ended. 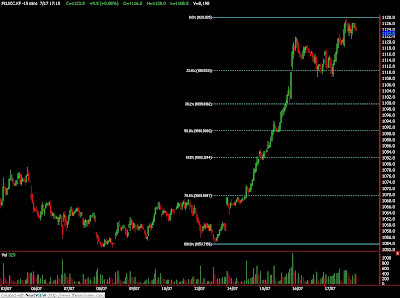 Technically, FKLI seems encounter some support around 1052.5 regions while manage to rebound 50% at 1061 regions. Based on our technical interpretation, our opinion suggest FKLI would continue to trade lower in the coming trading session provided resistance levels at 1063 and 1070 were not violated. 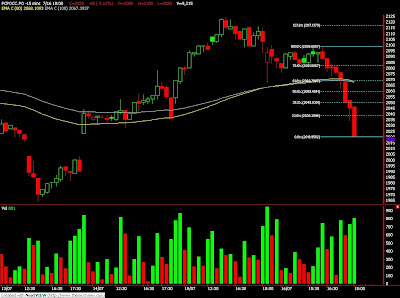 Traders were advice to hold short position while be alert around support levels at 1052 and 1030 regions. FCPO 3rd month Sept Futures contract fall RM20 lower to close at RM1990 levels as compare to previous trading session with 7,427 lots traded in the market. CPO were trade within wide range as soybean oil and crude oil electronic trading recovered after dropped in the morning trading session. 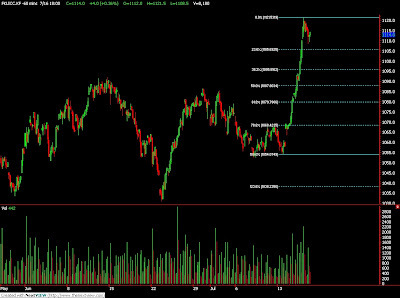 Technically, CPO price seems complete rebound levels at 2000; 50% Fibonacci rebound after manage to reach 123.6% Fibonacci projection levels at RM1960 regions. Based on our technical knowledge, we expect CPO price would continue to trade lower in the coming trading session with support seen at RM1950 and RM1930 regions. Traders were advice to hold short position provided resistance levels at RM2000 and RM2035 were not violated in the coming trading session. July 13 (Bloomberg) -- Palm oil futures in Malaysia gained amid concerns that an El Nino that’s forming over the Pacific Ocean may curb production of the tropical oil as the weather pattern parches parts of Asia. The weather event may delay monsoon rains in Asia, the U.S. National Oceanic and Atmospheric Administration said on July 9. About 90 percent of global palm oil production comes from estates in Indonesia and neighboring Malaysia. During the last El Nino in 2003-2004, palm oil prices “rose by close to 100%” even as output gained 6 percent, RHB Research Institute Sdn. analyst Hoe Lee Leng said in a report dated today. Still, RHB maintained a price forecast of 2,300 ringgit ($640) a metric ton this year until the severity of the current El Nino has been determined. Palm oil for September delivery added as much as 1.2 percent to 2,035 ringgit a ton on the Malaysia Derivatives Exchange, and traded at 2,018 ringgit at 12:22 p.m. local time. So far this year, the price has averaged about 2,182 ringgit. The Japan Meteorological Agency said on July 10 that sea- surface temperatures indicated that an El Nino weather event was taking place and may continue until Japan’s winter. Australia’s Bureau of Meteorology also said on July 8 that there were indications that an El Nino was developing. “El Nino has historically been a profit windfall for plantation companies,” Credit Suisse analyst Tan Ting Min said in a report published today. Still, rising palm oil stockpiles in Malaysia and waning demand from importers, including India, may push prices lower, Tan wrote. Malaysia’s palm oil production climbed 3.6 percent 1.446 million tons in June, pushing inventories to 1.41 million tons from 1.37 million tons in May, according to Malaysian Palm Oil Board data released on July 10. Exports climbed 3.1 percent to 1.27 million tons. Palm oil imports by India, the world’s biggest buyer of edible oils after China, may be “unsustainable,” as the country completes restocking, Tan wrote. India’s palm oil purchases from Malaysia, the second- largest producer, rose to 23,040 tons in the first 10 days of July from 2,200 tons in the same period in June, according to cargo surveyor Societe Generale de Surveillance on July 10. To be sure, average palm oil prices may fall to 1,800 ringgit a ton in the second half from 2,250 ringgit in the first six months on rising inventories and a slower global economic recovery, Maybank Investment Bank Bhd. said in a report today. Palm oil also gained as soybean oil advanced. The contract for December delivery rose as much as 0.7 percent to 33.69 cents a pound on the Chicago Board of Trade after analysts and traders surveyed by Bloomberg News forecast that last week’s price drop may lure importers and investors this week. July 13 (Bloomberg) -- Crude oil was little changed near an eight-week low on speculation the global recession will sap demand for fuel and increase stockpiles. Oil capped its biggest weekly decline since January, raising concern OPEC may hold a special meeting to discuss production limits. The producer group doesn’t need an extraordinary meeting and will review output levels in September, Venezuela President Hugo Chavez said July 10. Prices dropped as U.S. consumer confidence fell and fuel stockpiles in the largest oil consumer rose for a fourth week. Crude oil for August delivery was at $59.99 a barrel, up 10 cents, in after-hours electronic trading on the New York Mercantile Exchange at 8:29 a.m. in Singapore. The contract fell 0.9 percent to $59.89 on July 10, the lowest settlement since May 19. New York oil reached an eight-month high of $73.38 on June 30. Prices gained 37 percent the preceding two months as rising equity markets emboldened investors and the falling U.S. dollar steered funds into commodities. U.S. gasoline demand usually peaks in June through August as motorists take to the roads for the summer holidays. Brent crude for August settlement rose 17 cents, or 0.3 percent, to $60.69 a barrel on London’s ICE Futures Europe exchange at 8:21 a.m. Singapore time. It declined 58 cents, or 0.9 percent, to $60.52 a barrel on July 10. Output disruption in Nigeria, Africa’s biggest oil producer, may keep prices from falling, traders said. The Atlas Cove oil jetty and depot in Nigeria’s Lagos state is on fire after an attack late yesterday, the Movement for the Emancipation of the Niger Delta said in an e-mailed statement. Rebels claimed to have blown up a pipeline to Chevron Corp.’s export terminal in Nigeria’s Delta state on July 10. The Organization of Petroleum Exporting Countries, which pumps 40 percent of the world’s oil, will meet on Sept. 9. July 13 (Bloomberg) -- Malaysia’s average palm oil price may fall to 1,800 ringgit ($503) a metric ton in the second half from 2,250 ringgit in the first six months because of the slower global economic recovery and rising inventories, said Maybank Investment Bank Bhd. “The recent price correction will gain momentum,” Maybank Investment said in a report today. July 13 (Bloomberg) -- The yen and the dollar weakened on speculation Goldman Sachs Group Inc. will report the largest profit since it set earnings records in 2007, reviving demand for higher-yielding assets. The yen fell against all 16 major currencies after the opposition Democratic Party of Japan won Tokyo elections yesterday, spurring concern that political uncertainty in the world’s second-largest economy will worsen. The euro rose versus the dollar and the yen on prospects European Central Bank President Jean-Claude Trichet will today signal policy makers will refrain from cutting interest rates. The yen dropped to 129.44 per euro as of 10:37 a.m. in Tokyo from 129.00 in New York on June 10, when it completed the biggest weekly gain since May 15. The dollar weakened to $1.3959 per euro from $1.3936. The yen traded at 92.71 versus the dollar from 92.54. Goldman Sachs will tomorrow say it earned $2.2 billion, or $3.57 per share, in the three months through June 30, according to the average estimate of analysts surveyed by Bloomberg. Goldman’s trading revenue in 2009 will top its 2007 record as the firm profits from reduced competition after the collapse of rivals, including Lehman Brothers and Bear Stearns Cos., according to Bank of America analyst Guy Moszkowski in New York. The dollar declined against 11 of the major currencies after a finance official in Japan’s opposition party said the nation should consider diversifying its foreign reserves away from the dollar and buy International Monetary Fund bonds. The DPJ overtook Prime Minister Taro Aso’s Liberal Democratic Party to become the biggest party in Tokyo’s city assembly in elections yesterday, less than two months before national polls must be called. Nakagawa’s views contrast with those of the LDP, which favors buying U.S. government debt. Japan holds $1.02 trillion in foreign reserves, the world’s second-largest holder of the U.S. debt after China. China, India, Brazil, Mexico and South Africa last week questioned the role of the U.S. dollar as the primary denomination of world reserves. In China, whose foreign-exchange reserves probably topped $2 trillion for the first time in the three months to June 30, Premier Wen Jiabao this year said he was concerned that his nation’s dollar assets may decline as the U.S. sells record amounts of debt to fund stimulus spending.